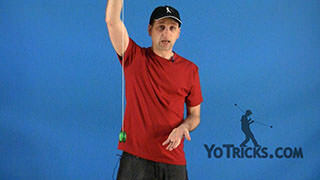 Learn the mechanics that make yoyo binds work. Bind Theory – What Makes Yoyo Binds Work? 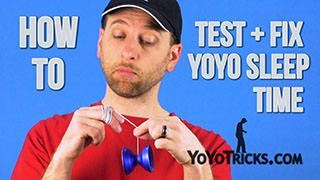 Yoyo TrickIn this video we are NOT going to talk about how to do any specific binds, instead, this video is about bind theory and we are going to try explain how binds actually work, that is, what’s going on inside the yo-yo that makes it wind up when you do a bind. Pretty much everyone knows that in order to bind you need to get enough string to wrap around the axle to engage the response system so the yoyo winds up. 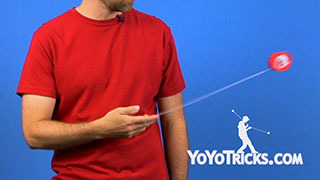 Most players seem to think that the best way to do this is by throwing this loop of string, called the TAIL, into the gap of the yo-yo. But what most players don’t seem to recognize is that throwing the tail into the gap is NOT the best way to do a bind, and in fact, it’s actually counterproductive and will prevent you from learning more advanced binds. Our goal for this video is that, by helping you understand how binds really work, we will enable you to not only learn more impressive binds, but also create new binds with ease. But first, before we can do any of this new fangled stuff, let’s establish some historical context. Ironically, another crucial detail of the binding equation had already been figured well before this, back when most yo-yos were made out of wood. 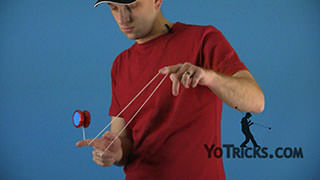 There’s this antiquated method of winding up a responsive yo-yo, we call it the Trapeze Windup technique. So, it’s like this, You’re going to put the dead yo-yo on the trapeze near your yo-yo hand. You can pinch the tail with your opposite hand, and you’ll see how the yo-yo string winds up when you roll the yo-yo into the tail, like so. When you try it for yourself, you’ll see how the string winds itself around the axle. The key element of bind theory which this technique demonstrates is that you can get the string to wind around the axle WITHOUT throwing the tail into the gap. The Trapeze Windup works because of the same principles which makes binding work. 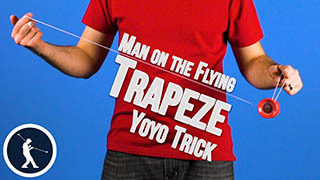 Now try this: with an unresponsive yoyo throw a breakaway, pinch the string, and try to do a trapeze windup. Notice that the excess string wraps up around the axle just like with the dead yo-yo. Before long, more than enough wraps will be on the axle to touch the response system, and yet, the yo-yo doesn’t bind. Now we know that you cause a yo-yo to bind by getting enough string around the axle to engage the response system, but why doesn’t it bind in this scenario? Now this time try going into a trapeze from a regular frontstyle throw instead of a breakaway, notice that if you do a trapeze windup here, it binds almost immediately. The difference here is that the yo-yo is spinning the opposite way. To explain why binds work in this case, we’re going to use two terms the yo-yo world has adopted to describe this: frontspin and backspin mounts. To begin with, these terms are somewhat arbitrary; front and back don’t actually mean anything in terms of front or back; they are named like this because they are opposites. 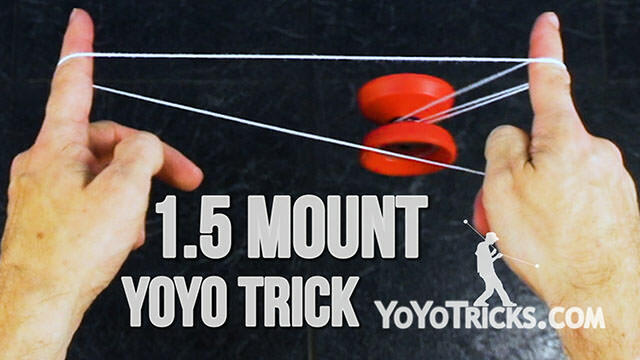 So, these terms describe which direction the yo-yo is spinning in relation to the mount the yo-yo is in, or to be more specific, we’re thinking in relation to the placement of the tail of the mount. In nearly every case, frontspin mounts are the most basic mounts you get into from any given throw, and backspin mounts are the inverse of any of the frontspin mounts, and these backspin mounts are ideal for binding. On the other hand, you will notice that you can’t bind using this technique from any of the frontspin mounts. 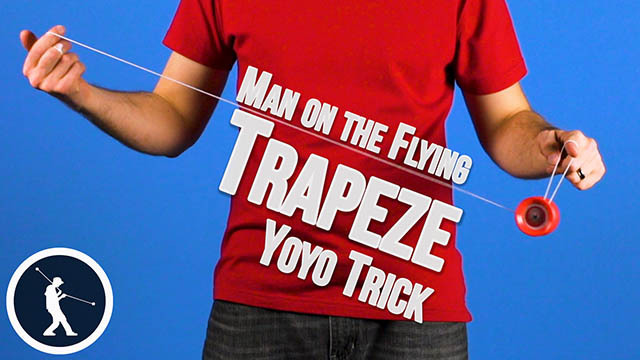 So the most natural mount to get into from a breakaway is the trapeze, and the backspin version of this mount is the undermount, because you’re mounting the yo-yo on the opposite side of the string. The backspin version of a one-and-a-half mount, is a trapeze and his brother – as you can see, you are just getting it on the opposite side of the string, making it a backspin mount – so you can bind from here just like you could from the undermount. So, like we said, the reason this works is because frontspin and backspin relate to the relationship between the tail of a mount and the spin of the yo-yo. So in a frontspin trapeze the tail is on THIS side compared to the yo-yo, while in a brother mount, the tail is on this side. And the same thing is true on any inverse mount the tail is also on the opposite side of the yo-yo compared to the regular mount. And we can’t forget it’s also the direction of spin in relation to the mount that defines this; if you throw a frontstyle throw instead of a breakaway, the yo-yo is spinning in the opposite direction, making all your frontspin mounts become backspin mounts and vice versa. So this leaves us with one question: why do backspin mounts work for binds but frontspin mounts don’t? In order to answer that question, we need to address one more element of bind theory: and that is outer race of the bearing. The bearing in a yo-yo works because there’s an inner race, which is stuck onto the yo-yo body, and an outer race, which spins independently of the yo-yo, this is what the end of the string is attached to. So when the yo-yo is spinning, the outer race of the bearing is actually not moving, because the string is holding onto it. And this is where things get kinda complicated. What we found is that a proper backspin bind begins when the segment of string that’s threaded through the gap of the yo-yo is pulled through the gap, this causes the outer race of the bearing to rotate in the same direction the yo-yo is spinning. Since the end of the string is connected to the bearing, it gets pulled around by the outer race. The bind fully activates when enough string has wrapped around the axle to engage the response system, which forces the yo-yo to wind up the rest of the way. This is how backspin binds work. Frontspin binds don’t work right because when you pull the string through the gap in a frontspin mount, the outer race of the bearing spins in the wrong direction. Because the string is wrapping in the opposite direction compared to the spin of the yo-yo, the response pads are actually trying to push the string out of the gap, rather than pulling it into the gap and winding the yoyo up. Now, if you use the tail to wrap enough layers of string into the gap of a frontspin mount, you can actually get it to snag and wind up. But this is bad technique because the wraps you put around the yo-yo are wound into the gap in the opposite direction compared to the rest of the string. This can cause all kinds of problems. So now we understand what happens when you bind from a backspin mount, but what’s going on when you do laceration binds like these, which aren’t exactly in any mount? It would make sense if you thought these worked just like an offstring bind, right? In an offstring bind, the end of the string, which is kind of like the tail equivalent for offstring, is wrapping around the bearing and catches the response system, so it winds up. In other words, offstring binds work regardless of how the outer race of the bearing is spinning, and this is because there’s no loop of string attached to the bearing for the outer race to pull around; the string still grabs the response system, but only because the tail is wrapping around enough times to do so. But the question is, is this how 1A laceration binds work as well? Surprisingly, if you’re doing the bind correctly, the answer is no; laceration binds and mount based binds actually work exactly the same way in 1A, by pulling the sting through the gap of the yoyo to rotate the outer race of the bearing in the same direction as the spin of the yoyo. So I’m sure you want some cold hard proof. First off, we are only talking about laceration binds setup in the same way as backspin mounts. To check, grab the tail of the laceration as the string goes into the gap of the yoyo. If, when you put your finger into the tail, the mount that is created is a backspin mount, then you have a backspin laceration. (For the record, frontspin lacerations work as poorly for binds as frontspin mounts… they are prone to snags, and just don’t work all that great). When we unwrap the string, you’ll see that the string is wound up in one direction, but when you get down to the tail segment, it’s actually wrapped around the opposite way from the rest of the string. In fact, the string underneath the tail is wrapped around the yo-yo the right way as well. This demonstrates that we are still pulling the outer race to start the bind, but when the tail wraps around, this interferes with the normal winding of the bind, causing a snag. But you may wonder, can you actually pull the outer race of the bearing far enough to execute a bind without wrapping the tail? The answer is, yes, watch this. If you perform the same laceration bind, but use your opposite hand to block the tail from wrapping, it will still bind, but without a snag. In other words, the tail entering into the gap of the yo-yo does nothing except interfere with your potential to hit a clean bind. So how come sometimes when the tail gets whipped into the yo-yo, the bind is still clean? In this case, the tail is not causing the bind, but because it’s wrapping around the yo-yo in the opposite way of the spin, the pads push the tail out of the yo-yo while the outer race of the bearing pulls the END of the string into the gap. So, in this case, the tail is actually fighting against the bind itself, because the spin of the yo-yo has to remove the tail from the gap before it can wind up cleanly. To get laceration binds to work consistently without snagging, first, we need to get sufficient contact between the bearing and the string threaded through the gap. So if you think about how a laceration works, the more the tail bends around the bearing, the more contact the string has with the bearing. Once enough of the string is touching the bearing, but before the tail wraps all the way around, the second thing you need to do is pull on the string that is threaded through the gap. If you have sufficient contact, this will cause the outer race of the bearing to rotate. In turn, this will pull the string connected to the bearing around the axle, and execute the bind. The more contact there is between the string and the bearing, the more efficient the pulling force will be, and this is true of any bind outside of a mount. Grind binds are a good example of this, since these also take place outside of mounts. The key with grind binds is to pull the string in such a way to maximize contact between the string and the bearing. So, in the Talon Grind the bind will be most effective if you pull the string down. In a finger spin bind, pulling slightly towards yourself while pushing the yoyo into the string will cause the most effective bind. The two most common reasons why binds don’t work for new players is that you’re either attempting to bind with the yo-yo on the wrong side of the string. That is, you’ve got it in a frontspin mount when it needs to be in a backspin mount, or you are not holding the pinch long enough. Beyond this, there are several things that will help you to have more consistent and more effective binds. The first thing to consider is the length of the tail. In a Basic Mounted Bind, notice how you can change the size of the tail by adjusting the placement of your hands before you pinch the string. In practice if the tail is too short, you won’t have enough string to wrap around the axle, so the bind can’t work. However, if you overestimate the size of the tail, then you run the risk of tail wrapping. Depending on the yoyo, or the rate of spin, having a longer or shorter tail can make executing binds more effective. The slower a yoyo is spinning, having a longer tail allows you to feed more string from the tail into the gap, reducing the work the yoyo must do to wind up. If the yoyo has a wider gap, you will need a larger tail to get the string to wrap around the axle enough times to connect with the response system. 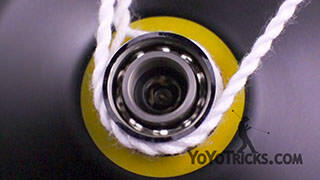 The same is true if the yoyo’s response pads are less grippy, further from bearing, or recessed. Center Trac and Konkave bearings will also require a slightly longer tail than a flat bearing. And if yoyo string is thinner or worn down, you will also need a longer tail. The inverse of all these statements hold true as well, so thicker string, more grippy response pads, thinner gaps, etc., will all allow binds to work with a shorter tail. One last thing. 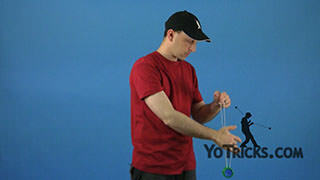 If you want to avoid having a long tail getting wound into a yoyo, you can always drop your hand under the yoyo as you release the pinch while the yoyo binds. This will get the tail out of the way of the yoyo, so that it will not get wound into the gap. Even with perfect technique, bad equipment can keep your binds from working, such as having a worn out response pads, or old string that needs replacement. So if you’re having more trouble binding than usual, and putting on a new string on doesn’t solve the problem, then the pads are probably worn out and they will need to be replaced. Also, if you can pull the string out like this easy, either the strings or pads are worn out (assuming you don’t have a poorly designed yoyo). If you are interested in learning specific binds we have plenty of other videos to teach those tricks, but we feel if you come to fully understand the bind theory in this video any bind will be easier to learn and perfect. And that’s Bind Theory.